It´s some months since I´ve accomplished the certification process for the German SKS (Sportküstenschifferschein), the equivalent for the RYA Coastal Yachtmaster (read about it here) and I didn´t intend to line up for another certificate in the first place, but some days ago I´ve completed application process for yet another one: The German SSS, or as we call it, the Sportseeschifferschein, equivalent to the RYA Yachtmaster Offshore. 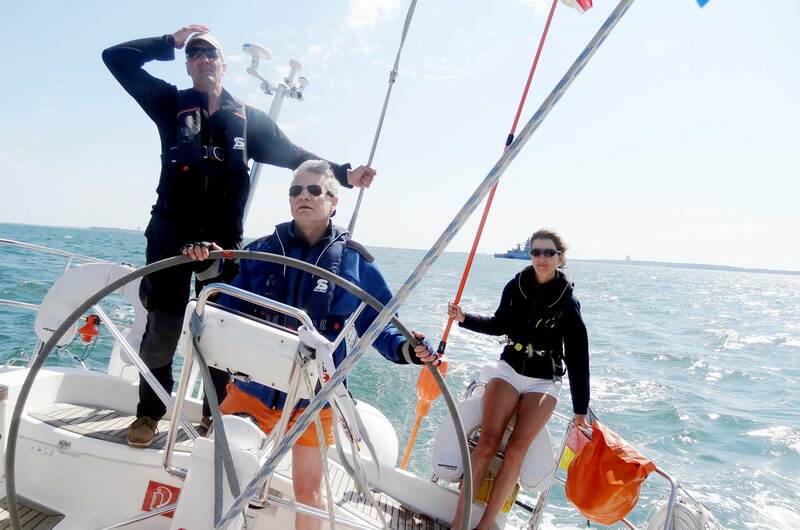 This would then be my fourth official license in sailing – but why am I doing it? 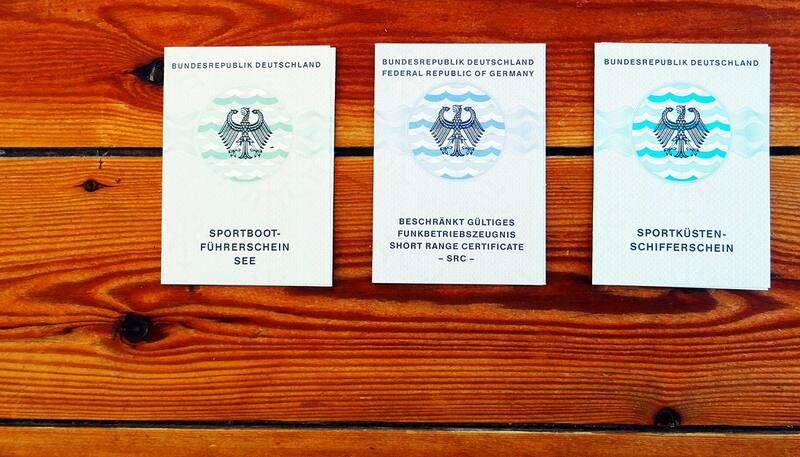 In Germany, there´s quite an awkward situation concerning the official and semi-official certifications fotr skippers. At first, you neet the so-called SBF (Sportbootführerschein), which is a legal document by the German state. A permission to steer a pleasure craft. The “driver´s license” for the water. The point is – upon requiring the SBF, you are allowed to be on the water, yet you are not able to steer a boat safely. On the other hand, those certifications which in turn grant that you are able to sail are in fact no permission at all to sail a yacht officially. So that´s kind of weird. So, upon requiring the SBF (read it here) I did the SKS (here´s all about the SKS and RYA Coastal Yachtmaster) and of course the SRC (Short Range Certificate) for operating VHF-equipment. 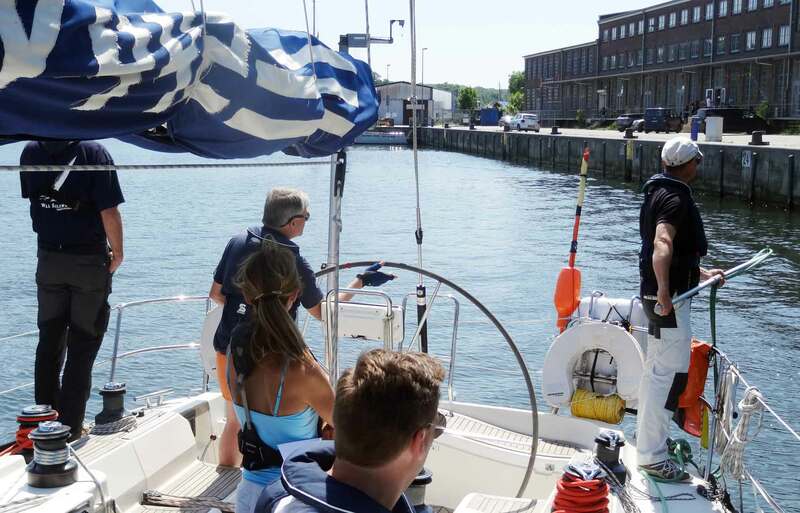 That´s a lot of stuff but after having those three certificates I feel well educated and ready to be in command of a seagoing yacht – which I tried lately (read about my first ever experience as a skipper here). Nevertheless, now I am lining up for yet another certification, the SSS/Yachtmaster Offshore. What´s that all about? The SSS, apart from the fact that this is yet another step in educating myself as a seafarer, is customary for skippers who intend to commercialize their passion. So, as life plays in manifold facets, it may be a thing of the future for myself to be (at least part-time) a professional skipper selling his skills. Therefore, the SSS is a must-have. As with every sailing certification, the course consists of both a theoretical and a practical part of which I again chose the latter to be the first and have the somewhat “dusty” theory-stuff in winter time. Plan is to acquire SSS-degree by the end of this year. Some 700 miles of sailing experience as either boat captain or skipper of a seagoing yacht will have to be verified after SKS had been acquired, which indeed is no problem for me as the sailing trip from Lisbon to Lanzarote early this year alone sums up to roughly 1.000 miles (read all about this extraordinary sailing experience in these articles). The SSS-topics are wide spread and promise to be of exciting hours over books, in class and of course behind the steering wheel of our sailing school´s yacht. Three thick books for SSS/SHS certification. Still a pleasure? Last week a chunk of class books arrived, unboxing the mail was the first proof of the fact that the SSS is in fact a step ahead and a leap forward in requirements and level of demand compared to SKS/Coastal Yachtmaster. 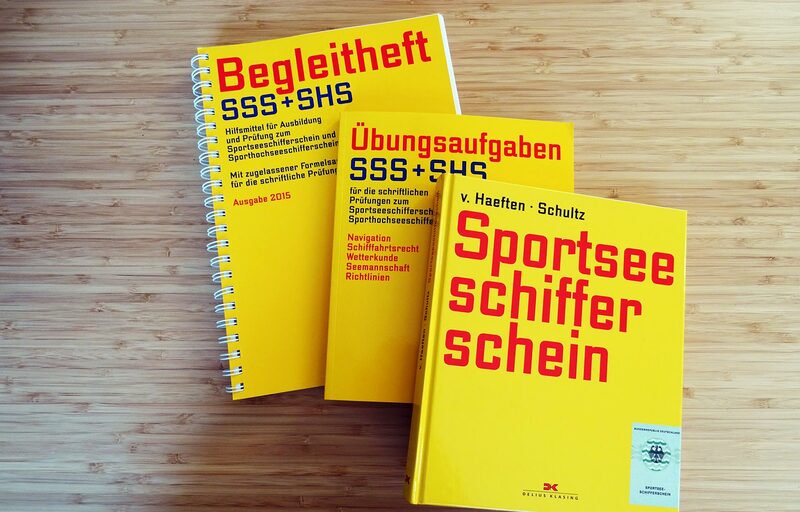 That´s three thick books all in all – though I must admit that two of the books also contain content for the last and biggest of the German pleasure craft certifications, the SHS. Nevertheless, the sheer amount of information gathered here is breathtaking indeed. At first I am very much looking forward again to the practical part of the SSS-course which will again take place on my beloved X-442 performance cruiser of my favourite sailing school. I simply love this boat for her rich – and reminding – history. As an X-Yacht, she is a true racer, even hove-to she makes 3.5 knots flat and she´s a beauty under sails. Best thing about it: My very course will again be taught by Dietmar, my favourite skipper and a true role model for me personally. One week aboard, I hope, my fellow class mates will make up a cool team to have fun with learning. I am very much forward to those 7 days and I can´t barely count the days till August when the class begins. I hope that we will get some fair winds – no calms above all – and good weather as well as some shaky, windy and wet moments to add some spice to the story. Can´t wait! After – hopefully – passing the practical examination the theoretical part of the course will be held during winter time and I hope to be able to acquire the SSS-certificate in 2017 before new year´s eve. We will see. Topics of this course – apart from actually sailing the yacht, casting off and landing – will be crew management, effective communication methods, an emphasis on safety and MOB-measures as well as maneuver training on the yacht itself. The course is set to achieve a gain in competence in the first place, passing the exam is a mere by-product. This is why I chose this particular sailing school: It´s about getting us to be good seafarers, not to pass a test to acquire a piece of paper. Speaking of the theoretical part, here is where most of the effort will take place. Traditionally, German certification process has its emphasis on theory and the sheer number of pages in the three books is true proof of that. The theoretical part of the SSS, as well as that of the SKS, is done using the example of the English Channel (for the SKS it was the German Bight area), to which I very much look forward to. First is, of course, navigation. As far as I can see from reading the table of contents, there´s not many new things as all topics sound familiar. Nevertheless, there are some new topics like dead reckoning navigation, navigation by waypoints and GPS, a deeper insight into AIS or plotting. 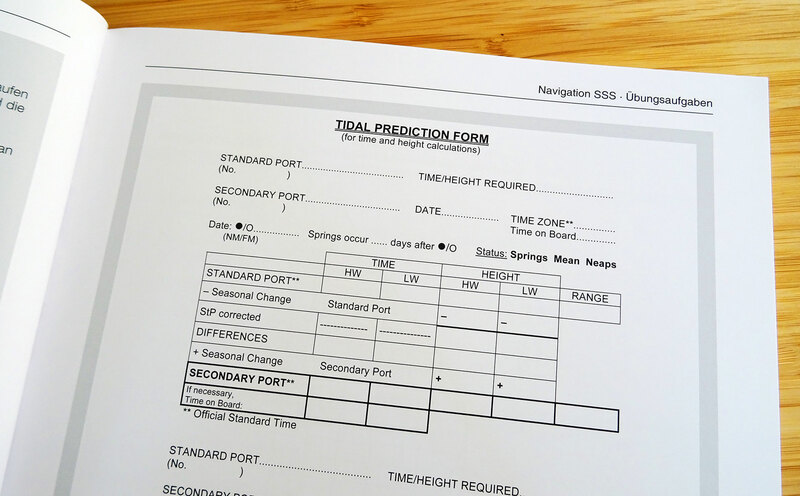 Old school tidal prediction and calculation. Best of it: In English! Tidal calculation was a big thing in SKS and it still is in SSS. This time the area changes to be the notorious English Channel, to which I am very much looking forward to as this is a very interesting sailing area I will definitely put my own yacht into when the boat is finally ready to sail again after her refit. As far as I can see, there has not much changed here to the SKS-certification except the fact that we will use Admiralty Charts and calculation forms in English. I like it. Nevertheless, is the tidal prediction by hand still a reasonable thing? 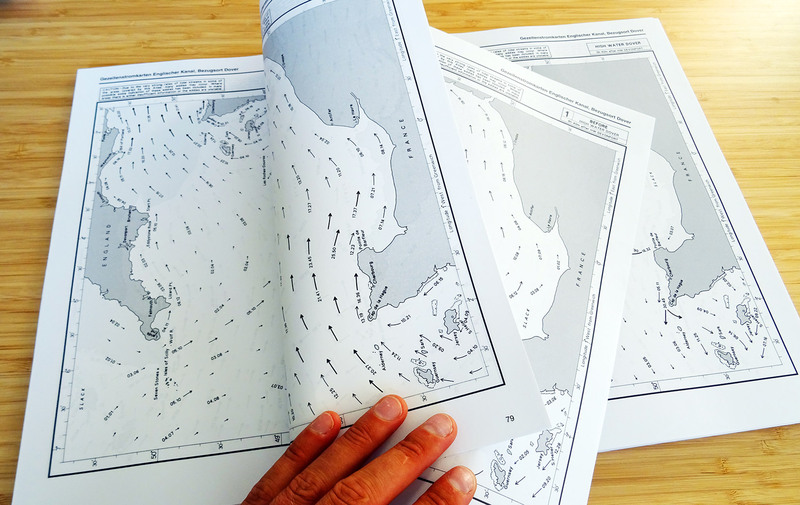 I don´t know a single sailor still buying tidal charts or atlases to do the calculations by hand. There´s an App for everything. 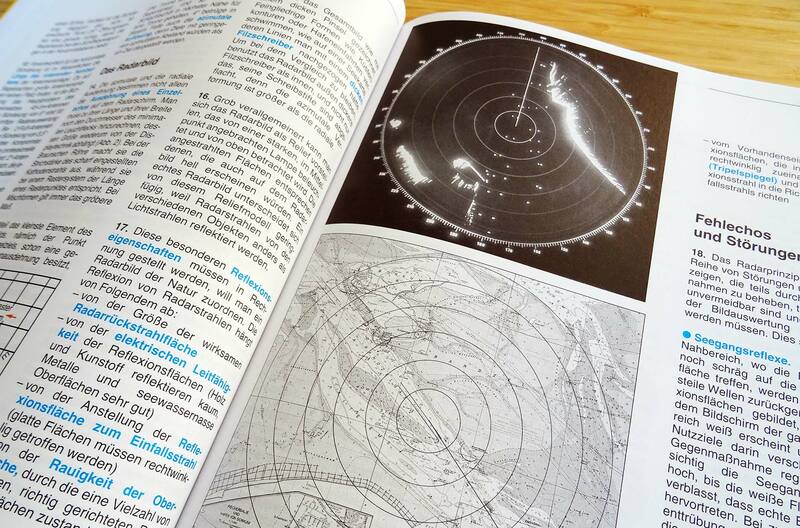 Another big emphasis in German SSS-education is Radar. Again, I doubt that this technology is all too important for most of the skippers sailing out there as modern AIS on large touchscreens is in most sailing areas as reliable (and even more powerful) that AIS and sufficient for most situation. Again, I also think that Radar still is and most supposedly will always be the technology of choice when sailors leave the populated areas and go to the extreme North or South. Besides, it has a romantic, if even anachronistic touch to work with Radar so I am also looking forward to this. 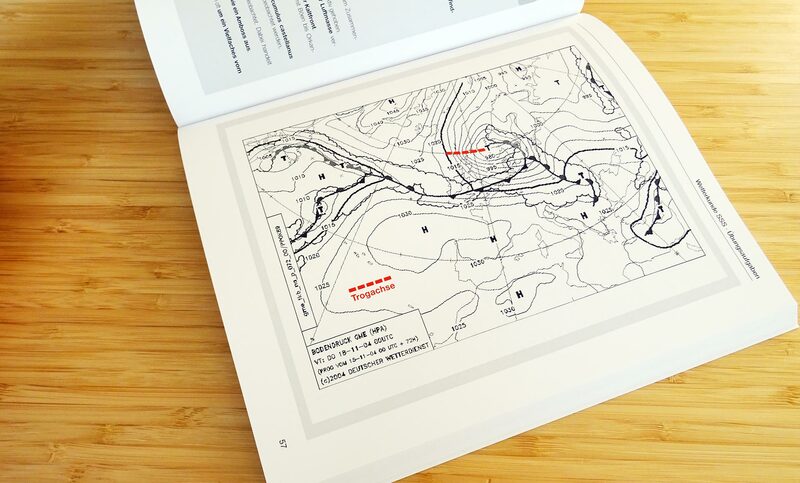 I am so much looking forward to working with weather charts again! My weak spot: Legal stuff like lights and signs, traffic rules and all connected topics. That´s simply tiring and boring stuff. Also, it´s a diligent but routine piece of work and I know that if I pound all to regularly this stuff into my head it will stay there (at least until after the examination). Will there also be an App available to learn all that stuff? Apart from that, another large topic of the SSS-course I can´t wait to do is weather. I simply love looking at isobaric charts and trying to do my own weather forecast. 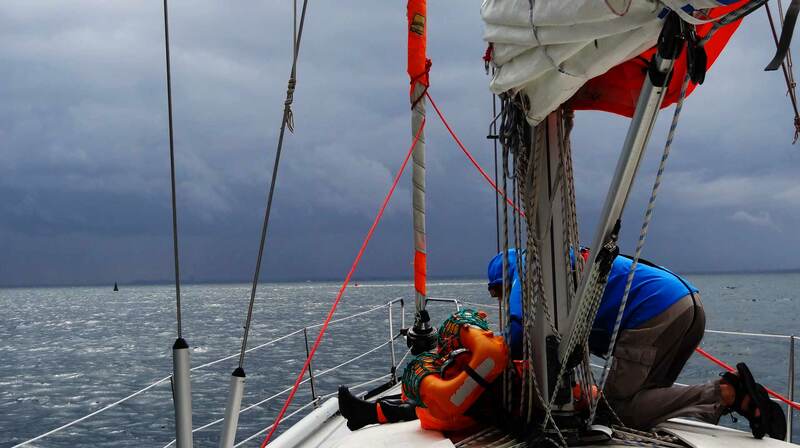 Last but not least – in my case choosing to make practical exam before theory that´s a bit odd – there is the topic of seamanship, crew management and being a skipper in general. That´s preparatory to the sailing week during SSS-class, for me it will be refreshment and recollecting the sailing class. Items here is a stark emphasis on MOB-procedures, medical stuff like stitching of wounds and psychological strategies in leading a crew. Again, many of my readers will ask what´s the point in telling us about German certification process as most of us do the RYA-certificates? Where´s the difference anyway? Well, I find it interesting how these two certificates are differing to each other and in some ways not. 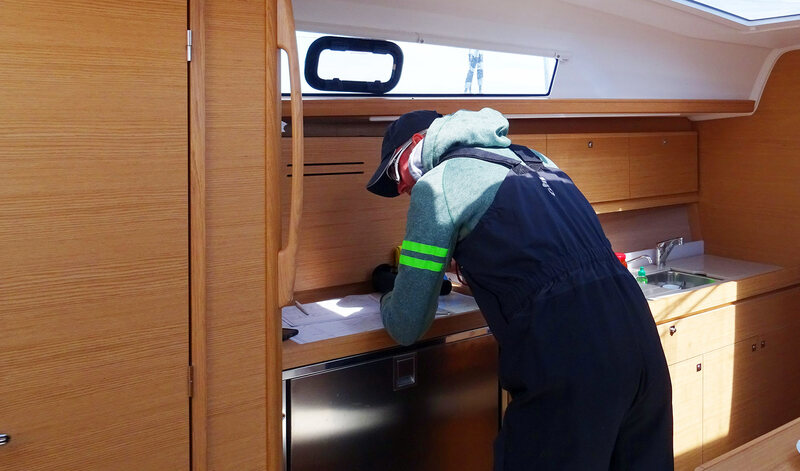 As I mentioned, with the SSS comes a vast amount of theoretical knowledge and loads of capabilities of the “old school seafarer” whereas the RYA Yachtmaster´s certification process is a very subjective, practically oriented one. Both have their eligibility and as Richard Jeske, skilled sailor and renowned sailing school-operator puts it: The RYA degree is of slight superior quality as it is richer in themes, more practical oriented and the examination process a lot more intensive. On the other hand, the German education bears more factual knowledge. Besides, since this year´s beginning German authorities have tightened demands for passing all of Germany´s sailing certifications furthermore, making it even harder for people to acquire the degrees. Which I like, to be honest. For example, for most part of the practical examination, there is no second chance anymore – as there won´t be a second chance in most real life situations as well. We will see how hard the exam will really be. Well then, in the coming weeks I am going to read myself through these pages of the nice yellow books in order to get myself prepared for the upcoming challenge. There´s also another week of sailing right ahead, my second time as ship´s skipper and this time in charge of two fellow crew mates, one of them being an experienced SHS-sailor. As with everything you do – if you do love what you do and do it with passion, it will turn out to be fun. Thus, I am feeling prepared and look forward to the challenges ahead. Stay tuned. What makes a good Skipper? zum Thema Wetter wird das Buch von Haeften/Schultz definitiv nicht reichen. Viele Zusammenhänge werden einfach ignoriert. Das Bucht dient als gute Orientierung, inhaltlich halte ich das Buch aber für ungenügend. Radarplotten ist gut beschrieben, Wetter unzureichend, Seemannschaft ungenügend, für Recht ließ zusätzlich die KVR und SeeSchStrO im Original. Zusammenhänge, Erklärungen und Hintergründe haben wir uns mit Hilfe weiterer Literatur beschafft. Zusätzlich haben wir viele alte Prüfungsaufgaben (z.T. sogar veraltete) genutzt. Danke für den Hinweis. Zum Thema Wetter habe ich eine Menge Literatur schon hier & gelesen, Seemannschaft ebenfalls. Dann gibts ja noch den Kurs, den ich auch belegt habe. Falls ich merke, dass es nicht reicht, werde ich mir natürlich noch Material besorgen.